On Philippine National Independence Day. I was not able to celebrate our Independence Day together with other Filipinos last Sunday. Not that I do not want or not because I did not believe in it but there were some responsibilities that I needed to attend to. Here is a brief history of the Philippines as I understood it. The oldest fossil found in the Philippines is 22000 years old but it is believed that the islands has been inhabited 30000 years ago. The first settlers were the Negritos, Malayans and later Indos. Even before the first century, there was social and political structure in the islands. There was a group of people in the same area called Barangay and they have a chieftain called Datu. 14th Century. Arabs introduced Islam to the South. 1521. First western visitor came, Ferdinand Magellan, who by the way fought with a Datu called Lapu-Lapu. 1543. Ruy Lopez de Villalobos, a Spanish navigator named the islands “Las Islas Felipinas” in honor of Philip II of Spain. 1569. More agressive attacks by the Spaniards. The Spanish ruled the islands until 1898. There was a brief interruption of the rule from 1762-1764. The Philippines was under the British for 2 years. There were small revolution going around for a long time. It was in the late 19th century when the filipino rebels became more organized. 12 June 1898. 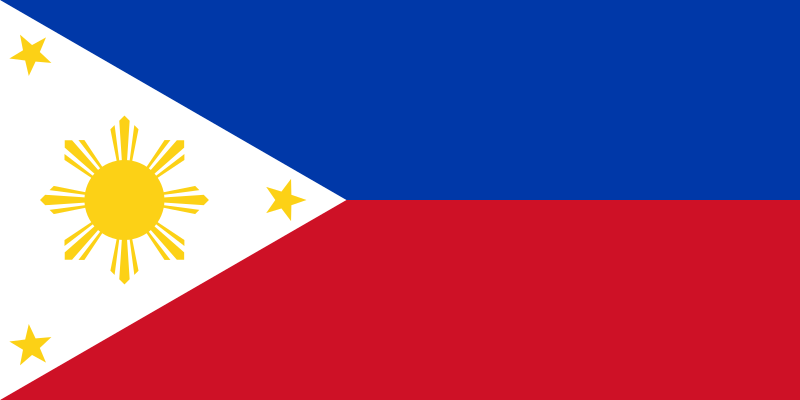 The flag of the Philippines was unveiled. Under the leadership of an american appointed president, Emilio Aguinaldo, declared the Philippine independence from Spain. Spain turned over the Philippines to America for 20 million dollars. 1899. Emilio Aguinaldo led the revolt against American Occupation. (And we thought they were helping!) The Filipino-American war lasted for more than 10 years. More than 600,000 filipinos died. 1942. The Japanese occuppied the Philippines until 1945. 04 June 1946. The United States granted our independence WITH STRINGS ATTACHED. They never really left. 1946-1961. The filipinos were celebrating independence day on 4th of July. 1962. President Diosdado Macapagal moved the Philippine Independence day to 12th of June. 4th of July was re-named Philippine-American friendship day. 1965. Ferdinand Marcos became president. 16 September 1991. Philippine Senate refused extension of lease to US Military & naval bases. Honestly, I have never celebrated June 12 the way that I should as a filipino. During my younger days, you would see me on the streets with a group of people demonstrating on the 12th of June. I am not anti-spanish, anti-japanese or anti-american. History is the way it is. But if you ask me, the philippines was independent on the 16th of September 1991, UNFORTUNATELY, not free from corrupt politicians. of course, when i say “own interpretation,” what i meant was we tend to highlight parts of our history that we feel are relevant. i guess our ultimate responsibility as citizens is to update ourselves — history is evolving — and go back to it from time to time. our nation’s mistakes stem from the fact that most of us forget our history. I agree with her completely when she said that every president who stepped in power has the backing of the white house and it is not only Marcos who was. I made Marcos as an example because he is the most popular of all our presidents, I assume, and also was under US protection when he fled from the Philippines. Thus, a very good example to show that we were never really free from US. When my brother, Alvin, and mother was here, we went to some places that I have been to so many times. Every time we have some visitors, we take them to the same places. The fascinating thing about going to the same places is that I discover new things and/or see things in another angle. When we go to Holmenkollen, we always go there during sunny days. When my family was here, we went there on a rainy day to make the most out of their stay. They only stayed for 2 weeks, unfortunately. It is my husband’s 47th birthday today (3 days after my birthday). We do not have any big plans on our birthdays. We are just going to stay home and have dinner together. Just a few weeks ago, we found out that John has cancer. (Please do not ask me to elaborate on this because I am not a medical person. ) It is not the agressive type of cancer, though. It is can be treated but he has to go through chemotherapy and another operation. We were told what to expect and what to do when he gets side effects from the cure. We are very hopeful that he would be cancer free in 6 months. Despite of the difficulties he is going through physically, he tries his best to show us that he is going to conquer this. Today, we shaved his head because his hair is starting to fall off but we had fun instead of feeling depressed about it. All photos were taken at Radiumhospitalet (Cancer Center). The staff in the hospital are superb! I just wish that the government would put more funding for the facilities of this hospital. Patients should not share room in this hospital. I think that it does not boost the morale of a patient if he sees what his room mate is going through and some handicap facilities are not working.